Workshop participants “voting” on what they consider to be priority problems of the Chili basin. Photo credit: Aleix Serrat Capdevila. 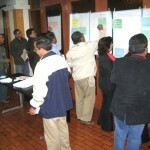 “inception” workshop (July 6-9) in Arequipa, Peru with stakeholders in the Chili River basin. The topics included Shared Vision Planning methodology, the new water law and institutions, and feedback on implementation with mitigation measures. The participants included representatives of municipal, irrigation, hydropower, mining, and upland herder interests of the Chili River basin; National, Tacna (observers from regional ANA) and Chili River basin water authority staff; a ground water irrigator from the Ica region; a representative from the regional governor’s office; and USAID observers. This “inception” workshop familiarized and prepared the participants for the establishment of a credible and transparent process of stakeholder collaboration for water management and planning. 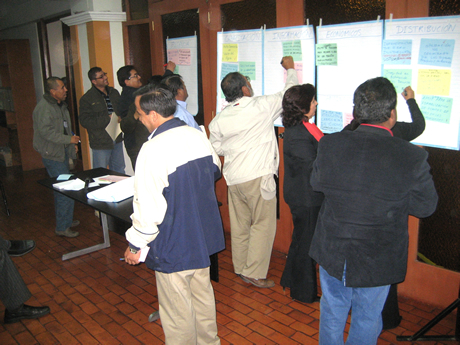 In addition, ICIWaRM worked to build capacity within ANA planning staff to implement similar Shared Vision Planning workshops in summer and fall of 2010 in four other Peruvian basins. Follow-up to the “inception” workshop of Chili River basin are two “collaborative modeling” workshops in calendar year 2010 to train local ANA staff on developing the hydrological modeling and decision support tools for collaborative water planning with stakeholders in the local basins. The training workshop will be hands-on and will result in developing local capacities for modeling as well as a preliminary collaborative model for the Chili River basin built with stakeholder input that reflect resources system, problems, visions, and multi-criteria indicators for evaluation and decision-making. ICIWaRM staff will also conduct briefs with USAID/Washington and the Interamerican Development Bank on the progress of the Peru water resources management modernization project.